Top Cruise Club, a new online social network for cruise travelers, launched today with the introduction of innovative new technologies. Created as a place for both cruise enthusiasts and novice cruisers to connect, learn, and save money, the website provides a platform for sharing information, price tracking, photo sharing, reward point programs, deals and beyond. TopCruiseClub.com is the first to market with a smart cruise fare tracking application, called Price Investigator, promising users never overpay for a cruise again. The tool tracks cruise fares based on information entered by users, and notifies that individual if a price drops below their purchase price is found, allowing the opportunity to seek reimbursement and obtain the best possible rate. Not only can this save cruisers thousands of dollars, but will also offer buyer confidence and thus, cruise lines with the ability to secure early bookings. Top Cruise Club is the brainchild of entrepreneur brothers Marc and Jason Cohen, along with developer Adrian Esquivel. 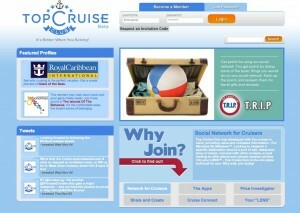 The site also provides a place for members of the travel industry (cruise lines, ports of call, shore excursions, etc.) to connect as well, allowing them to create their own profiles and interact directly with consumers through deals, incentives, contests, news and more. So girls, get online, get connected and start cruising!